Editor's note: Badi Badiozamani is an author, scholar and Iran expert. He is the first Iranian-American to run for governor of California. Badiozamani sat down with CNN to answer questions on the post-election situation in Iran. Iran expert Badi Badiozamani says optimists are hoping for a revote, while pessimists expect a severe crackdown. ATLANTA, Georgia (CNN) -- CNN: What, in your estimate, will Iran be like in two weeks? Do you expect the government to crack down to end the protests? Badiozamani: Optimists would say that the Guardian Council would have voted for a revote and there's going to be a new election. The real pessimists would say, no, that's not going to be the case. [Conservative incumbent] President Mahmoud Ahmadinejad and the Revolutionary Guard will try to crack down and crush the people seeking democracy. Tanks will be seen in the streets and this will eventually lead to civil war. CNN: Supreme leader Khamenei is scheduled to speak on Friday. What do you expect him to say. Any ideas? Badiozamani: He will probably speak about the divinity of this election. He'll probably tell/demand [reformist challenger] Mir Hossein Moussavi, [Seyed] Mohammad Khatami and others to not play into the hands of the enemies (the West in general, the U.S. in specific) of the Islamic Republic. He will then tell his followers to go back home and wait for the results of the investigation by the Guardian Council. CNN: Do you believe that another vote will be conducted? CNN: We're hearing there may be rifts developing among conservatives in Iran, with some clerics criticizing President Ahmadinejad in the wake of his harsh comments about protesters. What do you think about this? Badiozamani: I have heard that from different sources. And the fact that this comes from different sources usually indicates that there's some truth in it. Because this is a power struggle. It's not going to end, by Ahmadinejad or Moussavi being placed in the position of presidency. This will continue under another shape or disguise, at least for some time. 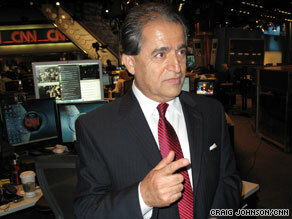 CNN: Would Moussavi be a much different president than Ahmadinejad? Badiozamani: There are different points of view on this. The pessimists will tell you that Moussavi has been tested as prime minister during the Iran-Iraq War. When civil liberties were violated and/or crushed by him, and whatever liberal-sounding, reformist-sounding sentences he uttered during his campaign can be easily forgotten because more or less the same thing was said by Ahmadinejad during his campaign. They physically arrested young people and shaved their heads. The guy who was saying, "It's not important," sent agents to arrest these guys and publicly humiliate them. That's just an example, of course. Optimists say, no, first of all he has changed. He's a man of character and don't forget during his time as prime minister he was a good manager. Ahmadinejad's time as manager and administrator has been nothing but a big failure. Also, they go, Moussavi is going to talk to the international community in a much nicer way and then he'll give some respect for Iran in the international community. The No. 1 thing they say is, "Anybody would be better than him [Ahmadinejad]." CNN: Do you think the change in U.S. administrations (from Bush to Obama) has played any kind of role in this situation? Badiozamani: To be fair to the Obama administration, he hasn't been in office a long time to access the long-term behavior of Iran. However one analyst's view was that if Iran made Ahmadinejad a second-term president it would mean the establishment in Iran meant it as a snub to Obama. Whereas a win for Moussavi would signal a thaw in relations ... and even a deal between the two countries. CNN: Is there anything the Obama administration must not do at this time, given this is a politically sensitive time for Iran? Badiozamani: I have received many phone calls from different people in Iran and overseas, expatriates, showing their disappointment in the U.S. administration's position of being too cautious in trying not to be accused of being interventionists or meddling in the affairs of Iran. The question they've asked me is: "Ask Secretary of State Hillary Clinton this: Every American, the Western Hemisphere in general thought of it as their moral obligation to help South African people get rid of the tyranny of the apartheid regime. Nobody called it intervention. In Iran, we have the same situation. Why should you call it intervention?" That is the question they would like the Madam Secretary to answer. And they add, "No matter what any U.S. administration does it will always be accused of meddling in Iranian affairs." The only question that remains is "Where is the moral obligation?" Once they say this, they remember [former U.S. President] Jimmy Carter, who was a champion of human rights and who was talking about human rights violations before the Islamic Revolution. Mr. President, over the past 30 years, you have not even mentioned even once any human rights violations in Iran. Why? CNN: What should Americans know about Iran and Iranians? Badiozamani: It is a huge country with beautiful green places, mountainous areas as well as desert and gorgeous gardens, Persian gardens. With its head in the Caspian Sea in the north and its feet in the Persian Sea in the south, its 72 million people with 10,000 years of civilization, very intelligent, very astute, who think of Iran at least culturally as a superpower. The people who have combined the great humanistic element of the ancient Persian religion of Zorastor with principles of Islam; a nation that craves to be recognized for its immense contribution to the world civilization. CNN: Is this about freedom, and what is the Iranian mindset as it relates to the concept of God-given rights? Is this about political rights or God-given rights? CNN: Is this, in your estimate, a bona fide revolution? Badiozamani: Some analysts would opine that it has the potential of becoming a revolution but so far, by definition, it cannot be called a revolution because the person spearheading this [Moussavi] is a staunch believer in the Islamic Republic. He's not a revolutionary, in the sense of he's trying to change something in Iran today. CNN: Is this in essence the city Iranian vs. the rural Iranian? Badiozamani: That is [a] false ... characterization ... There are supporters of both candidates in cities and rural areas. Both have had millions of votes. The quarrel is how many millions of votes. In a fair and unbalanced election, both of them would have had millions of votes. CNN: Do you think the Western media is accurately covering the people that support Ahmadinejad? Badiozamani: The media in general has been shut down by the government in Iran and that is a big issue. Same analysts say the Western media is mentioning it too lightly, like "That's a given," instead of criticizing and putting pressure on the government. And some analysts say the supporters of Ahmadinejad are given every time of publicity through the system. The system has not only its own national radio and TV programming but TV stations in other languages, and proxies in other countries, such as Lebanon and Palestine. And the question some analysts would pose to you is that if a gang of gangsters burglarized your house and stole something from you, would it be the Western media's responsibility to be fair and balanced, rather than try to hear the suffering and misery of the victims, or try to present a "fair and balanced" view of both sides.